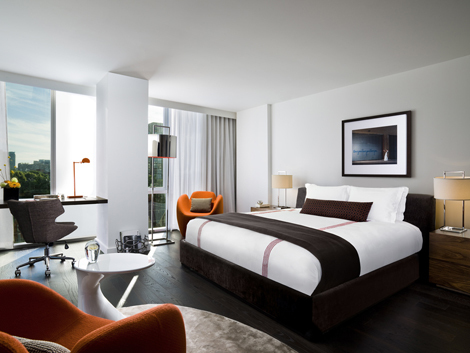 The Thompson Toronto opened in 2010 with 102 rooms. Next door there are 360 Thompson residences. 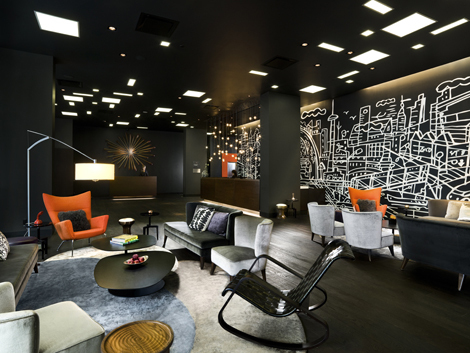 The Thompson Hotels brand has eight other properties around the world – three in New York, one in Chicago, one in London, one in Miami and two in Mexico. 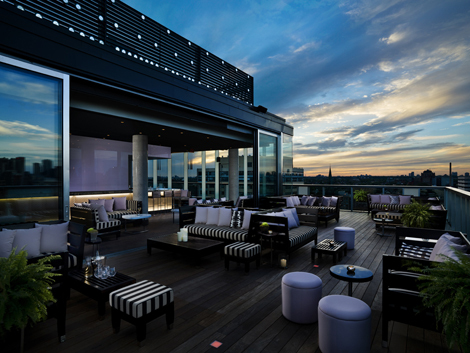 The Thompson is known for its “scene” – on summer weekends the rooftop pool terrace is packed with people sunbathing and drinking cocktails, while at night the Wildflower basement club pulls in groups of well-dressed party-goers. The European-style Colette Grand restaurant (run independently but accessible from the lobby) is also popular with locals, so the hotel always has a buzz about it, which I like. It feels part of the city – I am told that the property makes more from food and drink than it does from the rooms, and on a busy Saturday night you could have up to 1,100 people spilling out on to the street. For this reason, if you are looking for a quiet place to stay, this probably isn’t it (the rooms are well sound-proofed though). The big, high-ceilinged lobby with black and white murals on the walls sees reception directly opposite the entrance and lifts to the left (you need a keycard to get to your room so despite all the people coming in and out, it’s secure). 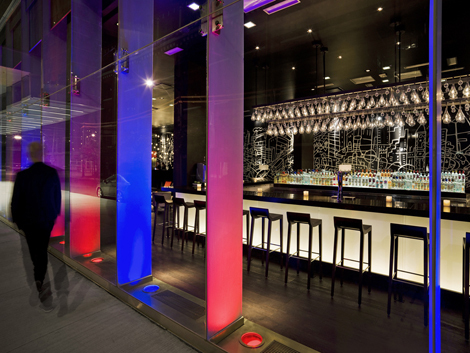 To the right is a lounge with sofas, sit-up stools and a bar – full-height windows look out on to the street. DJs perform here Thursdays to Saturdays but music is played throughout the day as well. 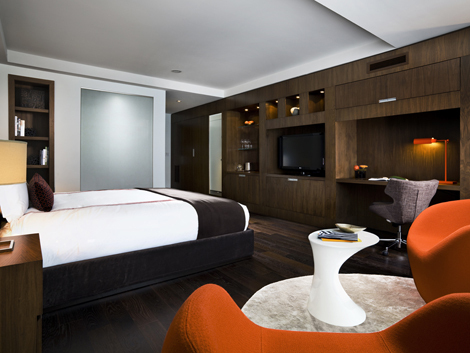 The overall look of the hotel is urban, minimalist and masculine, with black the unifying colour. It’s edgy and modern but the welcoming, professional staff add warmth. On Wellington Street West, in King West Village, which is also known as the Fashion District. 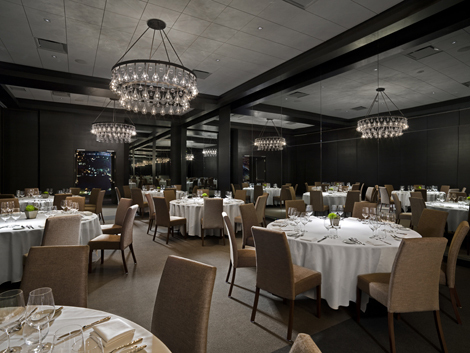 The Thompson is 28km from Toronto Pearson International airport. UP Express trains run every 15 minutes, taking you from the airport to Union station in 25 minutes. Guest rooms are located on floors three to ten, the premium floor. New York’s Studio Gaia is responsible for the no-frills design, bringing together dark hardwood floors and furnishings, grey marble bathrooms and clean white walls. Here and there you might find a splash of orange. All rooms (starting from about 39 sqm) come with 42-inch plasma TVs with movie libraries, free wifi, iHome docks, air conditioning, well-stocked minibars, workdesks, wardrobes, laptop safes and floor-to-ceiling windows. Bathrooms come with Co Bigelow amenities and robes. I was staying in a King suite, which also had a Nespresso machine, a separate bath and shower, and a living/work area with a couch and desk. (If I had to be critical, I would say this part felt a bit soulless.) I found the bed (with 300-thread-count sheets) to be supremely comfortable. The views weren’t of anything special, just the street below, but I had everything I needed during my stay. Room service, it can be noted, is excellent – very speedy and great food. Not something I find very often. The only problem that I faced was being woken at 5.30am one Saturday morning by the fire alarm going off – an announcement said the emergency services were on their way but to stay in the room and wait for further updates. I didn’t want to take any chances so made my way out of the building down the stairs. Only a few other people were out on the street and it turned out to be a false alarm, but it took about 45 minutes to an hour until the alarms could be turned off and the lifts activated. Staff were very apologetic. Although the ground-floor Colette Grand restaurant is a partner of the Thompson, guests can charge meals to their room. 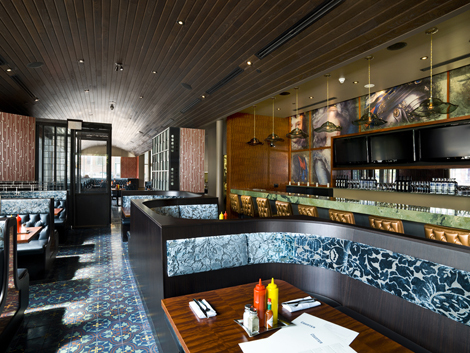 With 140 covers, it has a marble-topped counter for seriously delicious-looking buffets, as well as a mix of outdoor, dining and more informal seating in the “library” area. It is also has a bakery (open 7am-6pm) for takeaway pastries and bagels. The interiors are light and elegant. There is also a classic American diner open around the clock and serving up calorific favourites such as truffled mac and cheese, and burgers. As well as the Lobby Lounge bar and Wildflower club, on the 16th-floor is the Rooftop Lounge – guests come out of the lift where glass walls overlook the outdoor pool, and turn left for the bar. There is both indoor and al fresco seating. I sampled a couple of cocktails here and would definitely recommend it to anyone looking for stunning city views. The service was a bit slow, though, especially when I came back in the day. For brunch, they make a good Caesar (Canada’s answer to the Bloody Mary – with added clam juice). Event space is to be found on the subterranean lower level. Wildflower club is essentially a big (204 sqm for 250 people) dark room with a cool luminous light installation, but it can easily be transformed to your specifications with cutting-edge audio-visuals and seating arrangements. It also has a private entrance. The slick Wellington ballroom, meanwhile, is almost 300 sqm and is decked out with mirrored walls and hand-blown chandeliers. It can accommodate up to 280 delegates – the venue can also be divided into two and has four drop-down screens. The 55 sqm Stewart room is well set up for board meetings and presentations for up to 30 people. There is also a screening room with oversized seating and built-in desks that can host a maximum of 41 guests. Facebook, Nike, Fashion Week and TIFF (Toronto International Film Festival) have all hosted functions at the Thompson. The rooftop infinity pool is only 12 metres long so is less for laps, more for splashing around in an admiring the skyline. There is a fair bit of space for sunbathing but it gets very crowded during summer weekends so you need to get your spot early. I was impressed by the well-equipped, 24-hour gym, which is located on the third floor. It was filled with light, not too busy, clean and with attractive city vistas. I enjoyed my stay at the Thompson. With its lively social scene it probably won’t appeal to the older generations as much but it has a solid offering for business travellers and is well-located. It also feels connected to the local neighbourhood, which is refreshing. HOW MANY ROOMS? There are 102 rooms across seven categories (King Superior, Double Deluxe, King Deluxe, King suite, Executive suite, Thompson suite and Penthouse suite). 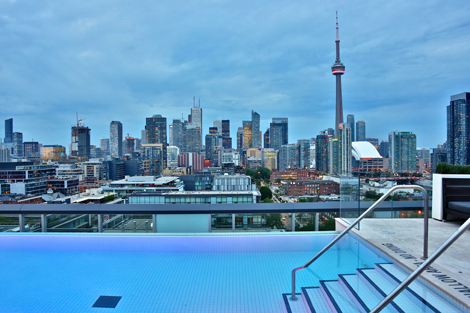 HIGHLIGHTS The rooftop pool terrace and bar with panoramic views of the skyline and CN Tower, the speedy room service from the 24-hour on-site diner, free wifi throughout and attractive Colette Grand restaurant. PRICE Internet rates for a midweek stay in a King Superior room in October started from CA$347 (£169).